It’s a well-known fact that some of our favorite seafoods come with an unsavory dose of heavy metals like mercury. But there’s another group of chemicals that sometimes lace our tuna steaks, and the latest findings on them are anything but appetizing. They’re called persistent organic pollutants (POPs), and they do a bang-up job obstructing the human body’s chemical defense system. That’s according to an analysis published today in Science Advances, examining how ten POPs found in both tuna and human bodily fluids interact with a gatekeeper protein that shuttles unwanted toxins out of our cells. The findings suggest that ingesting even very small quantities of POPs can do bodily harm. “These chemicals interfere with our chemical defense system’s ability to operate, which can make us more vulnerable to drugs and other toxins,” Amro Hamdoun, a biologist at the Scripps Institute of Oceanography and lead author on the study, told Gizmodo. POPs have been around for a long, long time. One of the most infamous, the pesticide DDT, was developed during World War II. DDT was banned in the 1970s, but other POPs, including flame retardants and non-stick coatings, are still widely used today. While these chemicals are damn useful in many applications, they’re a toxicologist’s nightmare. They degrade very slowly in the environment, they accumulate in biological tissues, and they’ve been been linked to everything from impaired neural development to obesity. Laboratory tests revealed that ten of the most widespread POPs all bind tightly to this protective protein, inhibiting its ability to do its job. Even at levels where POPs themselves pose no hazard, “they’re interfering with the very systems and pathways that have evolved to protect us,” Hamdoun said. Which types of seafood and which part of the ocean are most contaminated is something Hamdoun and his colleagues are still figuring out. But we know enough to start taking some common-sense precautions, including routinely testing seafood and tracking potentially contaminated stocks. Update 4/16/16: This story originally quoted Amro Hamdoun as saying that tuna are in the upper five percent of contaminated fish. 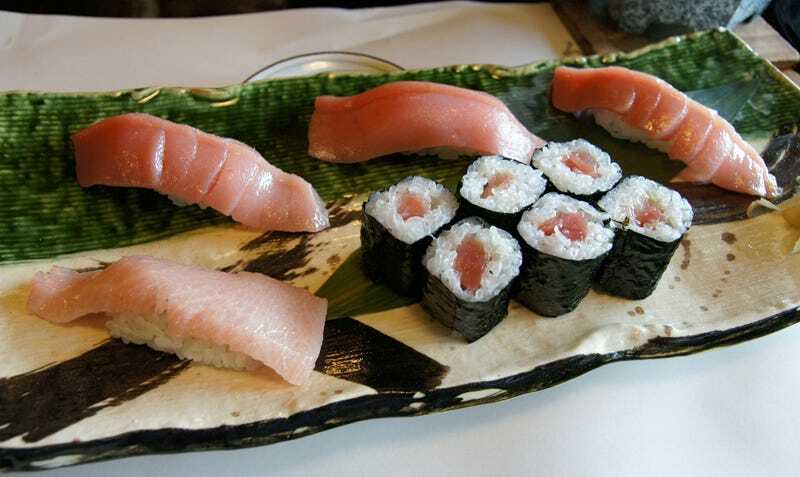 He later clarified to indicate that he meant yellowfin tuna from the Gulf of Mexico were among the most contaminated (top five percent) his team measured, when compared with a larger sample set of yellowfin tuna collected around the globe.